Over the last week, I’ve spent a fair bit of time playing with the Raspberry Pi, the cheap computer that has been created to inspire the next generation of computer scientists. There was a huge buzz when the Raspberry Pi was first released, and I see a lot of hard-core geeks using it to create hardware projects. But I’m not sure how many people are using it to just learn a bit of coding, or whether a lot of those early purchases are sitting in their boxes. The good news is that it’s not hard to set up. Mine pretty much plugged and played. I tried it on a TV and there was an overscan issue (text spilling off the screen) which can be fixed with some tinkering in the config files, but it worked perfectly with a monitor (and had a much clearer resolution). I was amazed that I could just plug it into my router and it would connect to the internet automagically. I expected that to be a real pain in the neck. The bad news is that it can display odd behaviour sometimes. I had the internet connection working in the command line (tested by pinging Google) but couldn’t get it to work in the desktop environment’s browser. That turned out to be a problem with the keyboard I’m using (a bog standard USB keyboard I bought to use with the Pi). My USB hub and/or keyboard are causing power conflicts that affect the Ethernet connection, and others have reported similar results. It’s easy enough to fix (by replacing them), but the lesson is to disconnect and/or try alternative hardware before tinkering with settings (which luckily, I did). Speed is a bit of a challenge: it’s not very responsive at the moment, although that could also be related to a hardware conflict, I’ve heard. It’s not uncommon to double click an icon and not get any response from it for a few seconds: long enough to click it again and find you’re opening the same program twice. The web browser coped fine with streamlined sites like Wikipedia but struggled to render more complex web pages, including my site (so please accept my apologies if you’re reading this from a Raspberry Pi now!). I’ve dabbled in the programming tools provided, and tried downloading and running various Linux packages, including GIMP which was a bit slow when processing a full resolution digital photo (but noticeably better when the image was resized), and the Calligra office/productivity suite which works well. There wasn’t a music player in the Linux distro I used, but LX Music works well, and VLC and Rhythmbox installed okay (but I haven’t tested them yet). LBreakout2 is a fun little breakout game you can try too. 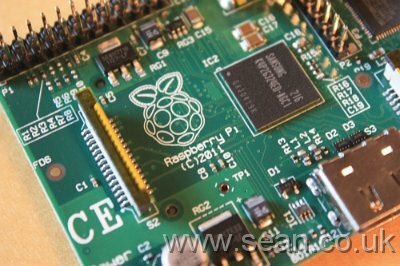 Have you got a Raspberry Pi, and if so, what have you done with it so far? I think it's a bit early for the educational side to come to the fore. You can't buy them in enough bulk to hand them out to kids just yet. For now people are playing with them, finding out what the capabilities are, and the motivated adults are putting together teaching-oriented programming environments. That said, there's a great picture on Google Plus of my friend's 6-year-old son working with Scratch on a Raspberry Pi. Yes, I agree it's a bit early for classroom use. The Raspberry Pi isn't quite robust enough in that it can display some unpredictable results with connected hardware, and teachers aren't up to speed with supporting them yet. I think there are some families who are having fun with them at home, though, and it's certainly ready for playing with Scratch, Python and the Linux environment.